Walk into the office, put down my purse, turn on the computer. Walk to the bathroom at the other end of the house to get an OTC medicine that I promise to give to a friend; I’ll be seeing her later. I feel smart that I remembered. While I’m in the bathroom, see the piles of laundry I’d divided earlier in the day. I had started one load and know it is finished washing. Carry a load to the laundry room. I have the medicine in my pocket. Still feel smart. Drop the laundry on the floor, start to unload the dryer. Almost the first thing out is a rug that goes in the screen porch. Take it directly there. While on the screen porch, look outside and notice that the bird feeder’s empty. Fill. As I walk back through the screen porch, I notice Audra’s rug, which has been drying outside. Take it to Audra’s room. Put the rug on the floor. The guinea pig squeaks eagerly at me. Decide to feed him. Notice that his food is strangely clumpy. Inspect his food more carefully. Yuck – it’s got worms in it. Walk to the kitchen and clean his bowl. Load a few (but not all) dishes into the dishwasher. Carrying the clean guinea bowl, swing into the office. Drop the medicine into my purse. Enter my password on the computer. This is the end of feeling smart. Stop by Clara’s room and look at her guinea pig’s food. Yuck – it’s got worms too. Pick up Clara’s guinea’s bowl and both bags of food. Leave the second bowl in the kitchen and carry the bags of food to the office. Sit down at my desk to call the pet food company. Start checking email. Realize I’m checking email when I’m supposed to be calling the pet food company. Mental head slap. Call. Transaction successfully completed, I carry the food to the front yard and pour it on the sidewalk. I figure the ground feeding birds will be happy to sample both the guinea’s food and the worms. Come back into the house, through the garage. See the extra rolls of toilet paper sitting on a shelf. Remember that the office bathroom needs toilet paper. Grab it. Stop by the office bath and leave the toilet paper. Go into the kitchen, throw the empty food bags away. Return to the office. Sit down at my computer. Remember that I never started the laundry. Return to the laundry room. Spend 20 seconds trying to remember why the dryer is open. Are these the wet or dry clothes? Another mental head slap. Figure it out, start laundry. While all this is embarrassing to admit, I know I am far from alone in my zig-zagged pursuit of cleanliness. One of my friends says that this is how she always cleans – haphazardly meandering from one room to the next. How much time and energy do we waste bouncing from chore to chore, room to room, idea to idea? When I’m aware of being aimless, I say to myself. “Focus. One thing at a time. Finish what you’ve started.” How much more could we accomplish if we attended to each thing in turn? At a minimum, I’m sure we could declutter 10 things in 1 day, rather than 1 thing in 10 days. Today’s decluttered item from Cindy: an ice shaver and 3 bottles of snow cone syrup. 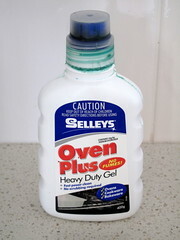 This oven cleaner doesn’t have what it takes to clean my “oven from hell”. I have persisted long enough in the hope that the situation will miraculously change but of course it hasn’t. I have thrown it in the trash because if it doesn’t work for me I can’t imagine it would work for someone else. Clean floors – I made the effort today to vacuum and mop and my tiles are all shiny and clean. Luckily the house was impeccably clean and ready for a rental inspection when Liam had his accident so I haven’t needed to do much. Air-conditioning – I don’t like to waste to electricity but it would have been unbearably hot in our bedroom last night if we didn’t have this luxury. We need to get a good night sleep especially at the moment. Still so grateful for automatic washing machines – Liam breaks out in sweats quite often and goes through several shirts in a day. All part of the healing process. Liam is having his best day since his accident today – one good one, one bad one seems to be the pattern. The little wretch has pulled off all the braces from this teeth that are supposed to hold his jaw in line but he seems pretty happy about it. I am happy if he’s happy even if he is naughty with it. A rainy day to cool things off – we won’t need that air-con on tonight I don’t think. I noticed the good day/bad day pattern after my father had his stroke, Colleen. I figured it had to do with maybe not resting enough on the good day, thus tiring him out too much and then the next day he’d be more tired and it would be a bad day. Anyway, glad to hear Liam is chugging along on the road to recovery! He seems to have gotten into a good rest pattern at the moment even when he is having a bad day. I actually wonder if his bad days are the days when his real personality is making a breakthrough and he is realising and terrified of what he has done to himself. It is terrible to see his distress on those days but to look on the bright side it may be more connections repairing themselves in his head and actually a step to recovery. Oh, it must be so hard to see his emotions like that, Colleen. But yes it could be the brain healing; what a mystery the brain is – we know so little about it, relatively speaking. All you can do is be there for him to share his feelings and his journey. Wishing you strength. Cindy – Thank you for the chuckles! I love this post; I certainly belong in the guilty crowd. Focus is key, I agree. I used to try to multitask and started way too many things at once. At the end of the day I had very little finished and felt disorganized and harried. I’ve found that thinking about the next two or three things I need to do helps. I may start a wash, do dishes, gather recycling. Then think through the next three things to do. It helps keep my focus. If I have a bigger job to do, I try to just do that one job – nothing else, not even something like laundry that seems safe enough ( after all, it washes and dries itself, right? but it will need switched from washer to dryer and will need folded and put away when it’s done!). Maybe it’s a sign of getting old, but I just can’t focus as well when I’m switching between jobs! this post sounds like me yesterday. I was all over the place. Cleaning the floor, toilets, bathroom and kitchen simultaneously at times I think. Trying to find decluttering items while all this was going on with a side trip of replacing some light bulbs which didn’t go well at all due to the fact that every light fitting in this house has screw in globes except one fitting so I had no spare globes. I am happy all the jobs are done but I need to get a little less manic about it but I suppose that is understandable at the moment. Thank you for reminding me to focus. Times of stress are when our systems break down the most. One thing at a time, and the cleaning will still be there tomorrow if you don’t get to it today Colleen. Glad Liam is continuing to improve. Yes, yes, yes… this is how many days seem to pan out for me… I thought it was menopause, I dont remember being so dithery in my younger days! I am REALLY glad to hear that others are just as lost in their everyday chores! These sort of days are exhausting; doing so many things but completing so few. I manage best if I write a list of things to be done even if it is the simplest things; ‘wash dishes’, ‘make bed’ etc. Then even if I complete the chores in random bits and pieces , I can tick them off the list and by bed time I can say that I did actually finish something. I also have the feeling that I may need a ‘Defrag’ and an extra stick of RAM for my brain… its running a bit slow at the moment! Defrag! Ha! I wondered it that would work. I find that a to-do list is absolutely my best stay-on-task tool, but I still get distracted. My to-do list includes “what’s for dinner” every day – just to cover all my bases. When my mother was an office manager, she said that she needed to write “Go to the bathroom” on her list everyday because it might be the only thing she got fully and successfully completed. She’s usually pretty focused, but she was interupted non-stop. I like using a list too because it gives me satisfaction to cross of as I go and feel like I am making progress. To add to my story: The ground feeding birds had absolutely no appreciation of the guinea food. None. It’s still on the sidewalk. How pitiful is that? well, I did manage to remove three big garbage bags and three boxes of stuff out of my house today. I loaded the dishwasher, wiped down the sink, pulled some more stuff out of the crawl space to go through. Loaded a sewing machine into a cabinet. I have a pile of old electronic stuff to go to the recycling center for Saturday. But I do tend to wander. it sounds like you are wandering to all the right places if you are getting that much done. It does pay to slow down sometimes like Cindy said and focus on getting projects finished just for the satisfaction of mission accomplished. Kathy, sounds to me like this was a great day for you. You accomplished so much! Good for you! That seals it, Cindy. We ARE the same person. I have been doing this for years! I call it the pinball machine as a I bounce all over the place – only sometimes accomplishing something and sometimes not. At the end of the day I fall back down the shoot and the next morning – “Boing!” do it all over again. yes, I love my lists, but there are 2 things that help me a lot. First, I repeat a very short mantra of three things to do like “dishwasher, vet, bills”. Once the first things is done, I add a new one on the end. Second, I find that if I listen to audiobooks I can do mundane chores and stick with them until they’re done. Great post, dear!!! I have a tendency to not focus on one task even though I know that doing so is more efficient! Having a list does help–if I can remember where I put the list. This is one reason why I continually declutter my house! I am less unfocused when the house is ‘focused’. Colleen, I think you’re right that the bad days may be when Liam is most aware of what his brain is and isn’t doing right now. Be encouraged! The brain is an AMAZING organ! having the house focused sounds like a good plan. The less cluttered and more organised you are the less you have on concentrate on at any time. We have been told as you say that the brain is an amazing organ. It just takes a long time to heal. I think Liam’s swearing neurons healed today big time. he seems to have stemmed the swearing a bit now. I wrote a post on my blog recently about “never wasting a step” which I learned from a family member. I’ve been trying to practice it but sometimes I stray. I love it that we get to start over each morning with a “new day”. You are welcome to read my post on this. if this is the first time you have left a comment I would love to welcome you here to 365lessthings. I took a look at the two posts you mentioned and I particularly like the idea of starting over each morning with a new Day. That is pretty much what is getting us by as our son heals at the moment and is a good creed to live by. Thank you for reminding me. This creed can also relate to our decluttering efforts especially when we are dissatisfied with our efforts on one day. Instead of beating ourselves up about it we can just wake up and start afresh tomorrow with a better attitude and renewed vigour. Actually I think this would make a good post and I think I will start working on that. It must be heart breaking to see your child struggle like that. It seems like you are all being very strong and brave! I’m VERY bad at multitasking. And quite talented at burning food in the kettle.. I’m a scatter brain. Sometimes we are strong and brave and others we are struggling but like Susan says we start over each morning with a new day and renewed hope. Don’t worry multitasking is overrated it just means that you are not giving your all to each individual task and burnt food proves that. Stick to one thing at a time it is far more satisfying and effective. I think we all fall for this one at times Lena.